Why Juice? supports your health in the midst of your busy lifestyle with original-recipe juices. We can regularly deliver to your home, office, cafe, shop, yoga studio, or anywhere you like. We are also happy to discuss deliveries to events and parties as well as opportunities to open new stores. *都内配達地域：店舗から約3キロ圏内。 *Delivery Areas: We deliver to certain areas of Tokyo, approximately 3km around the shop for a flat rate of 600 yen. Periodical cleansing can create a healthy and beautiful body from the inside out. Delivery is free for 4 or more regular deliveries per month. 定期注文についてはこちらからお問い合わせください。 Click here for regular orders. Why not try our juices for your weekly breakfast meetings, or for breaks after lunch? We deliver to events such as exhibitions and parties. 配達時間、配達料金は数量や場所に応じてお見積もり致します。 Cost and delivery time depends on the order amount. Please contact for details. Buying in bulk for your home is an ideal way to introducing vegetable juice to your lifestyle. Our boxed sets also make a great gift for your friends or loved ones. 発送料金：全国一律 600円(重量・距離により 900円～) Price: Starts at 450 Yen within Tokyo, and vary depending on the area. Install a juice stand in your office to mitigate insufficient vegetable intake and support a healthy work life. We also assist with sending multiple small gifts, such as for midsummer. 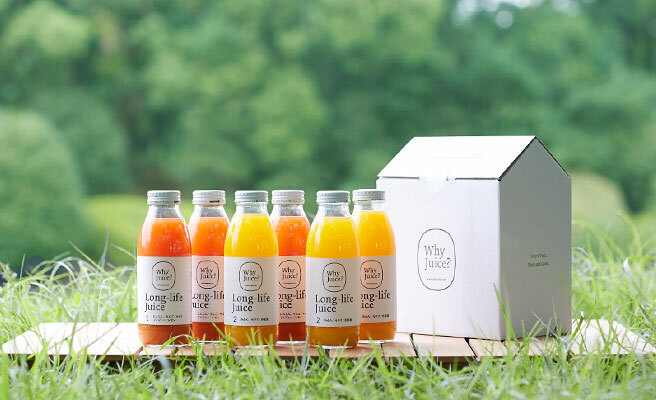 対象商品：Long-life Juice 24本～ Product: Long-life Juice, minimum order of 24 bottles. We are expanding our network of retail stores. We also supply gift boxes containing a set number of bottles. People should consume plenty of vegetable nutrients after sport or exercise. Why not stock our juice in your studio?